Built in 1783, this magnificent home with acreage overlooking the Housatonic River was the place where Norman Rockwell created so many of his memorable art works. 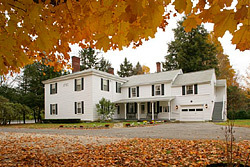 His studio, once on the property, has been relocated to the renowned Norman Rockwell Museum nearby. The home is filled with his memorabilia and his furniture but mostly his spirit. Accordingly, Delancey Street utilizes this home for training residents who have completed their two year commitment who will get the opportunity to study there to develop their talents in the arts. Delancey Street participates in the Stockbridge Historic House Tour during the month of December. Visitors get a chance to view some of the areas finest historic homes, complete with hot cider, home baked cookies and holiday decor. One of Norman Rockwell's former models (he used local residents) helps greet the visitors. We also hosted the 2007 Norman Rockwell Museum Board of Trustees meeting at the house, "An Evening with Norman Rockwell", catered by Delancey Street.